Here we have a very Mexican recipe since the main ingredient is “the corn" – which is nutritious, it provides lots of energy and it is a basic ingredient of the Mexican cuisine. In this cream the corn is ground and is combined with other ingredients that complement its flavor and they cover it with freshness. Since it is a cream milk and butter is used; as base – which give a creamy consistency and a soft flavor. 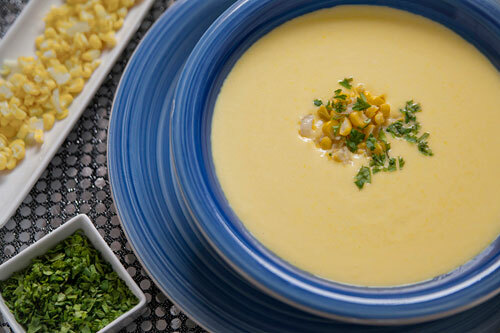 Although this soup hides a trick since not all the corn kernels are ground... therefore while you eat it you will be enjoying some fresh and crispy corn kernels. This is a perfect dish for the little ones because it is sweet. Likewise moms love it as it is easy to make, of quick preparation and the most important is cheap. To make this cream you won’t have any problem because there are only easy things to make. This recipe is prepared with golden corn, which have to be canned. In the preparation some ingredients are fried with butter and we recommend using a fine butter so the cream has better taste. 2½ cups of canned Golden Corn Kernels (17.6 oz). Finely chop 1/4 of an onion, 1 garlic clove and 4 coriander sprigs; the set aside. Melt in a saucepan over low heat 2 tablespoons of butter. Be careful with the butter don’t burn it because its flavor becomes bad and it will no longer serve. Add in the saucepan 1/2 cup of canned golden corn kernels (3.5 oz). Mix the saucepan ingredients and fry them for about 2 minutes, until the corn kernels are lightly fried; stir regularly. Bring the cream of corn soup to a boil over medium heat. When the cream of corn soup boils reduce to low heat and cook it for about 5 minutes, until it thickens a little; stir occasionally. Suggestion: If you want a very Mexican touch in the cream, garnish it with fried Poblano pepper strips. Variation: This cream can also be prepared in the version of soup. Did you like the Cream of Corn? Taste this cream with organic golden corn, the flavor is fresher and purer. The “Carnation Evaporated Milk" will give a very good flavor to your cream and an excellent consistency. The nutmeg is excellent for seasoning dishes that are made with a dairy base, you cannot miss it.